Welcome to 'Your Norfolk Extra', Norfolk County Council's monthly e-newsletter. At 11pm on 4 August 1914 Britain declared war on Germany, ushering in one of the darkest periods in our history. As the moment approached, the British Foreign Secretary Sir Edward Grey made the famous remark: “The lamps are going out all over Europe; we shall not see them lit again in our lifetime”. 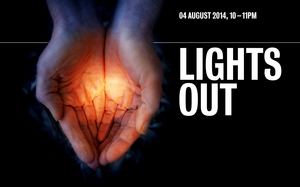 LIGHTS OUT is an invitation to everyone to turn off their lights from 10 to 11pm on 4 August, leaving on a single light or candle for this shared moment of reflection. See what other WWI events are on. On 21 June we held a celebratory event produced by and for people with learning disabilities and their supporters, as part of Norfolk’s programme of events for Learning Disability Week. Find out more about it here. For ideas and inspiration on free and cheap things to do with the kids during the school holidays, pick up your free copy of our Get into Summer magazine – available from libraries and children’s centres. There’s also the chance to win bikes for your family, plus the opportunity for one young Canaries fan to win the dream-come-true experience of being a match day mascot at Carrow Road. Norfolk has received an offer of £9.5m from central government to extend the reach of the programme. Find out more about Better Broadband for Norfolk. An eclectic mix of works by East Anglian artists inspired by birds. All pieces are for sale. On show in the Timothy Gurney Gallery, Norwich Castle until 31 August. For more information about the exhibition and to download a What's On leaflet. The Coasthopper service runs from King’s Lynn to Cromer half hourly in the summer and hourly in the winter, via Hunstanton, Wells and Sheringham. Last year the service carried over 500,000 passengers. The Coasthopper service will continue to run at the current frequency levels for both the summer and winter until at least autumn 2015. Find out more. For all the latest health and wellbeing news, sign up to Norfolk’s Living Well –Norfolk County Council’s new monthly e-newsletter. Click here to make sure you never miss a copy. Our Flood and Water Management team has launched its own Facebook page. Like it to get news and information on flooding issues, management and consultations in Norfolk. They also want people to post photos and info on areas that get flooded after heavy rainfall so they can investigate. Click here for more detail. To stop receiving these updates, click on the 'update subscriptions' link at the bottom of this email.